Trey Gowdy on Transgender Ban: Nobody Has Right to Serve in Military-Incorrect Attribution! - Truth or Fiction? Congressman Trey Gowdy (R-SC) said “nobody has the right to serve in the military” in defense of the transgender military ban announced by President Trump in July 2017. Comments about transgender people serving in the military were incorrectly attributed to Trey Gowdy after President Trump announced a ban on transgender service members in July 2017. The Military has one job. War. Anything else is a distraction and a liability. Did someone just scream “That isn’t Fair”? War is VERY unfair, there are no exceptions made for being special or challenged or socially wonderful. YOU change yourself to meet Military standards. Not the other way around. Comments appearing at unofficial Trey Gowdy Facebook community page led some to believe that Gowdy defended President Trump’s transgender military ban. After scouring news reports, we couldn’t find any public comments or statements released by Trey Gowdy on the transgender military ban. Of course, that doesn’t mean that he didn’t make them, but we can definitively say that the statement that “nobody has a right to serve in the military” did not come from Gowdy. Need a special access ramp for your wheelchair? Can’t run the required course in the required time? Can’t do the required number of pushups? Did someone just scream “That isn’t Fair”? War is VERY unfair, there are no exceptions made for being special or challenged or socially wonderful. 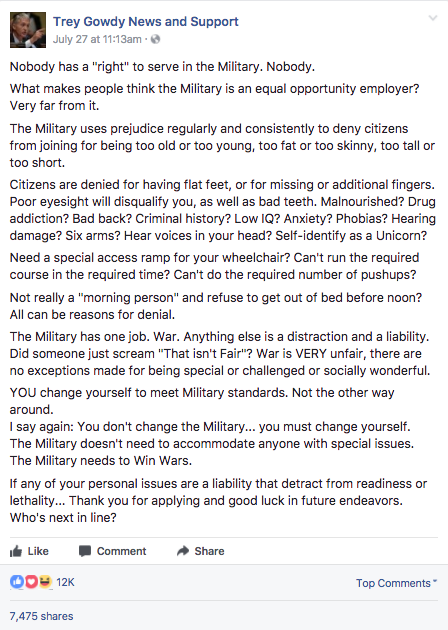 The Military doesn’t need to accommodate anyone with special issues. The Military needs to Win Wars. If any of your personal issues are a liability that detract from readiness or lethality… Thank you for applying and good luck in future endeavors. Who’s next in line? 339 People Severely Wounded, 66 Killed, Trump Just Addressed the Nation-Unproven! ‘Poor’ Maxine Waters’ $4.5 Million Los Angeles Mansion Raises Questions?